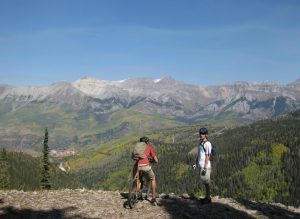 Telluride Ski Resort is opening a new bike park in 2019, with winding flow trails for mountain bikers of all abilities. Telluride is upping its mountain biking game in a big way this summer with a major expansion and revamping of its bike park. Sawyers, excavation crews and trail builders have been on the slopes since June cutting new trail, with plans to construct 10 new miles of singletrack for the on-mountain park. In addition to the new trails, crews will enhance the existing mix of cross-country and technical trails, with a total of $1 million invested in the project. The resort plans to open the park in June of 2019. All told, it will be home to 15 trails comprised of 17 miles of winding dirt designed to appeal to riders of all ages and abilities. The new park will incorporate Chair 4 to give bikers a lift to the top, and will also feature a new pass system. The resort’s CEO Bill Jensen says the expansion is the company’s way of catching up to industry trends aimed at drawing more visitors on a year-round basis. 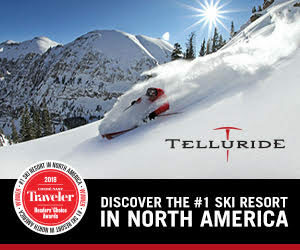 Ski resorts such as Whistler and Winter Park do big business with summer bike parks, and he thinks Telluride’s new two-wheeled options will boost the economy in Mountain Village and round out the ski resort’s year-round experience. He says the company anticipates selling about 10,000 day tickets in the first year, which could equal 200-400 more people in Mountain Village every day, riding bikes, eating at restaurants and shopping in town. “We see it as a way to bring some more energy into Mountain Village,” Jensen said. The ski resort is currently home to several miles of singletrack, but the inventory of existing trails leans toward expert terrain—cross-country routes with lung-burning climbs and technical downhill trails best suited for the kind of riders who wear full-face helmets. Much of what is being built this summer, Jensen explains, consists of wide, manicured flow trails that can be ridden by families or beginners. The idea is to appeal to a much broader audience. “We’re going to have a much more balanced and well-rounded product to offer visitors starting next year,” Jensen said. One aspect that may take some getting used to by local riders accustomed to the old arrangement (free rides up the gondola and free access to the park) will be the park’s new pass system. For visitors and the general public who do not have a winter ski season pass, single-day tickets will cost $36, or unlimited season passes will cost $199. For winter ski season passholders, an unlimited season bike pass can be purchased through a $25 donation to the National Forest Foundation. For bikers who only want to ride the cross-country routes, an unlimited season bike pass can be purchased through a $25 donation to the National Forest Foundation. Resort crews will be scanning passes into the park from 10 a.m.-6 p.m. daily, with the season running from June through October. However, the cross-country trails will open at 6:30 and close 30 minutes before sunset (to align with the gondola schedule). And bikers can access those trails before 10 a.m. and after 6 p.m. without being scanned. Each pass purchase will come with a donation to the NFF, which Jensen says will ensure that funds gets allocated back to local Forest Service offices for work on Telluride-area trails. The idea, he says, is to perpetuate trail expansion and maintenance long into the future.